This episode of Oh Karen! 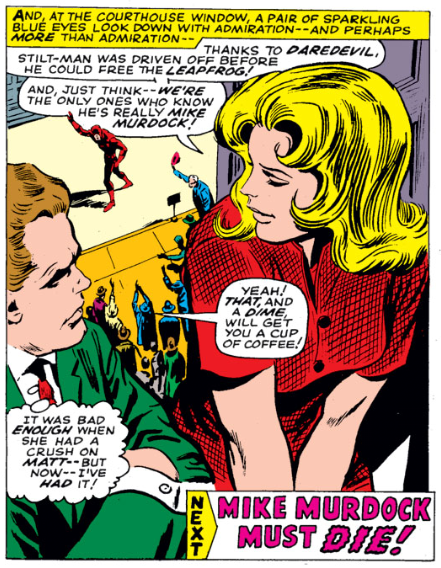 looks at the early issues of the Mike Murdock era through Karen’s eyes. I don’t think I’ll ever do a separate post about the madness that was this strange plot development, so what I do have to say about “brother Mike” will have to be said here. I’m sure he’ll pop up again when I discuss an issue he was in, and quite possibly in Oh Karen! #4, but that’s about it. If you want to read more about Mike, I direct you again to the links in this post, and this post. So, what does all this have to do with Karen? Well early Karen was quite promiscuous with her affections, and Mike Murdock managed to take her breath away. While she was still in love with Matt, Karen was quite taken with his other personality’s “bad boy” appeal. 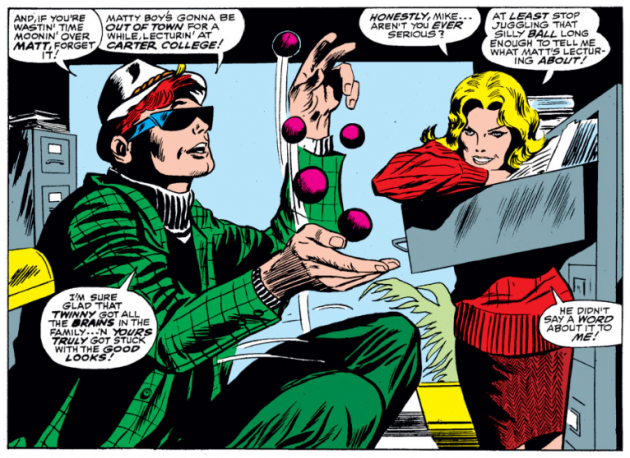 Below, we have the panel from issue #25 that started the whole thing. 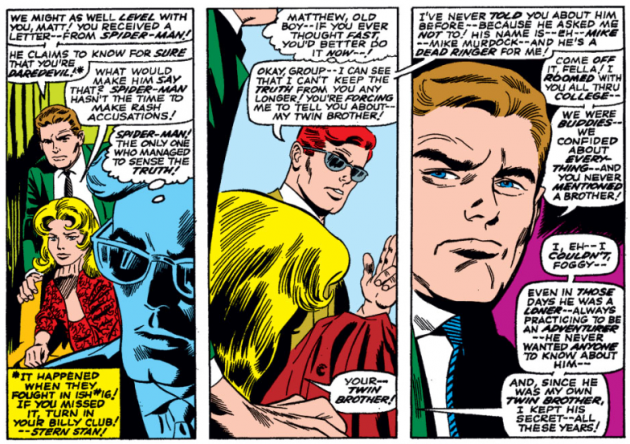 Spider-man has sent a letter addressed to Matt in which he confronts him with the fact that he knows that Matt is really Daredevil. Karen feels embarrassed about opening Matt’s letter, but in the light of the fact that he’s been missing for a couple of issues, she and Foggy were hoping to find a clue. 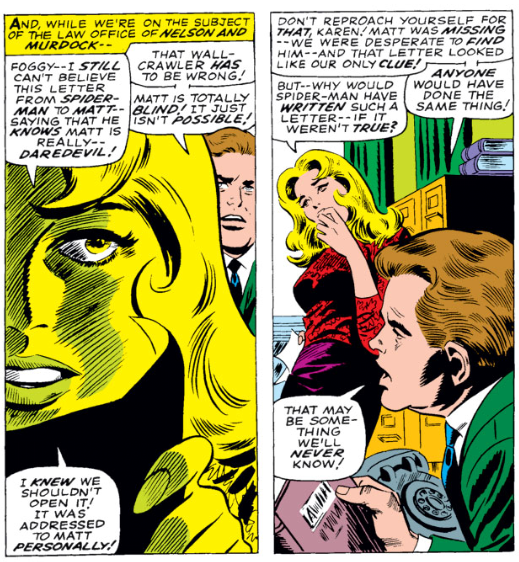 Of course, I do like Karen’s line: “But why would Spider-man have written such a letter — if it weren’t true?” I mean, it’s not like people ever make rash and unsubstantiated allegations, right? Yes, ladies and gentlemen. 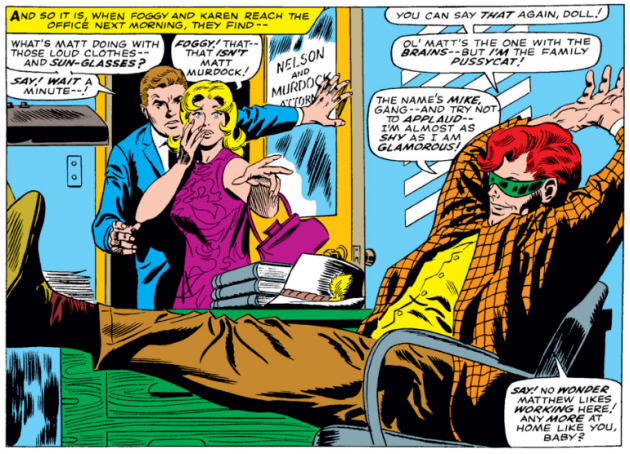 You’re looking at Mike Murdock’s big debut. I always wondered why Karen or Foggy didn’t question the fact that he’s just let himself into their office, and why he and Matt where never seen together, but thinking too much will inevitably give you a headache. It’s like thinking about where the universe ends or something. Despite being a fairly despicable figure, “Mike” manages to be quite successful in getting on Karen’s good side, whereas Foggy is more of a skeptic. I really do hope Matt has a good singing voice as he’s doing a song and dance (different panel) routine in the office in issue #26. Mike Murdock does not die in issue #27. 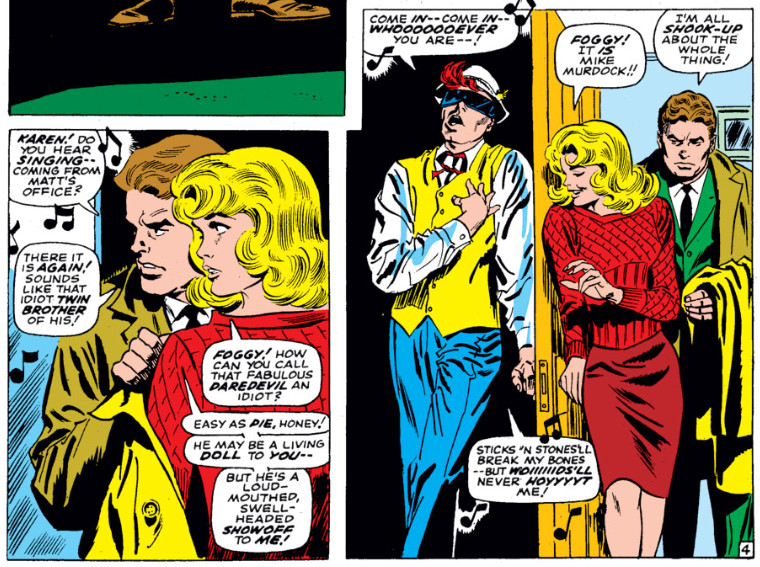 But Karen and Matt do manage to get themselves kidnapped by the Masked Marauder aka The Evil Landlord. The Masked Marauder wants to get at Daredevil and tries to get his name. 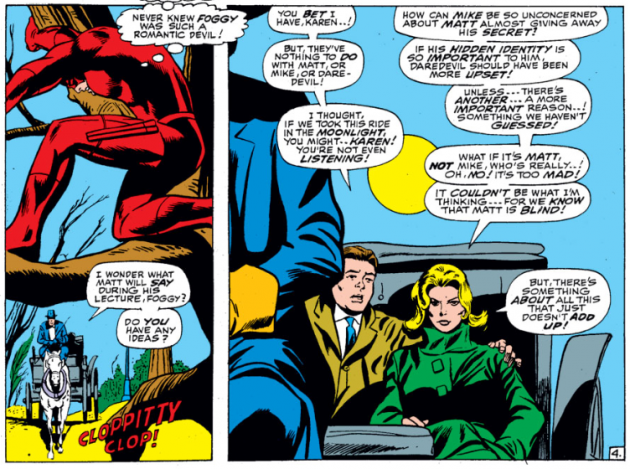 Matt finds himself in a jam, once again, as he is forced to reveal Daredevil’s “true” identity while coming off as the most disloyal brother in the world. In issue #28, Karen is still upset with Matt for his disloyalty, but seems to have all the time in the world to spend with Mike. Between all the kidnappings and the soap opera twists, it’s amazing they ever did any work at all in that office. Before going to Carter College to give a lecture about the legal ramifications of aliens arriving from outer space (though Mike has told Karen and Foggy that Matt has already left), Daredevil decided to ruin his friends’ date by dropping in unannounced. In this panel, from issue #28, we see Karen actually thinking, and getting dangerously close to figuring out how the whole thing fits together. By issue #29, Matt has decided to propose to Karen. At first, he can’t quite decide whether he should do it as Matt or Mike since he can’t really decide which one is his true identity(!) 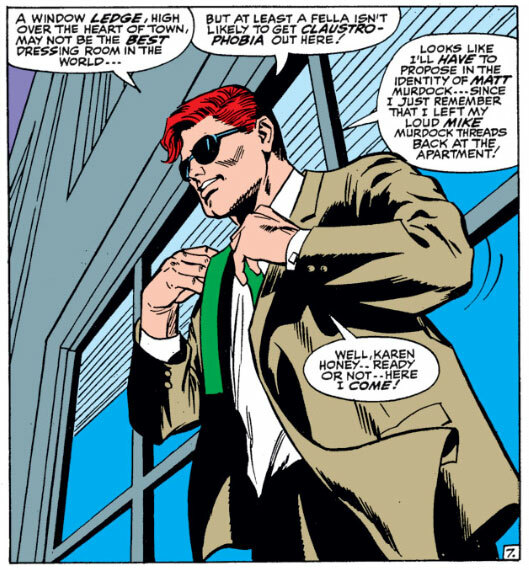 So, he does what any sound superhero keeping up three identities would do, he lets other circumstances dictate his course of action as he changes outfits high up on a window ledge. 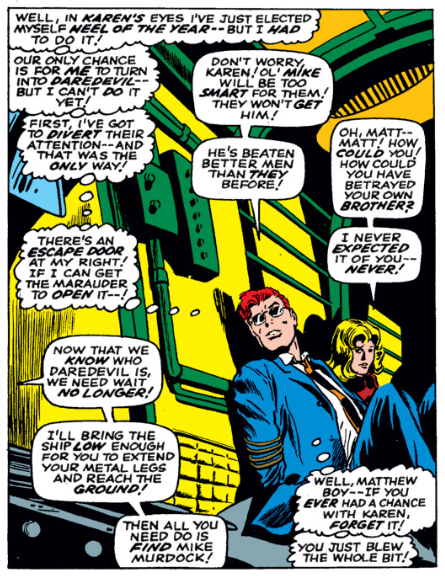 First, Matt gets a chance to redeem himself and clear his name when Karen is kidnapped by the Masked Marauder’s men. 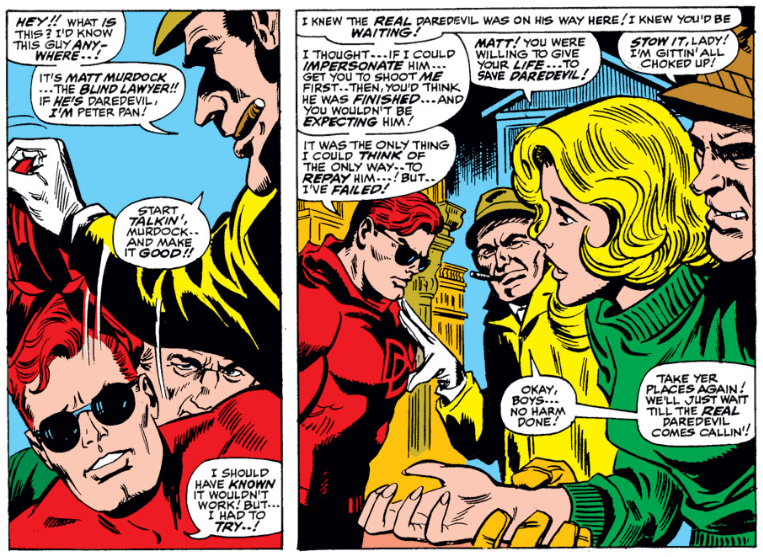 They have been tipped off by a note left by their boss that the people at Nelson & Murdock know Daredevil’s true identity. Daredevil rushes over there and now pretends to be Matt dressed up as Daredevil in order to protect his brother. Did you follow that? Me neither. This ends in the wonderful “unmasking” scene that is also portrayed on the cover, where we are led to believe that Matt actually wears his shades underneath his mask! 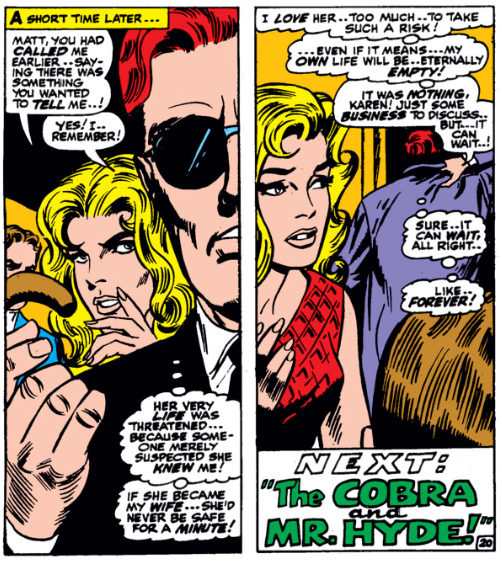 At the end of this issue, Matt comes to the conclusion that being married to him is simply too dangerous. In light of his track record as far as relationships are concerned, this is probably a valid assessment. His proposal to Karen was not to be, and it would be quite a few issues before they took their relationship to the next level. On the other hand, considering that she’d already been kidnapped five times since joining the firm, one wonders how big a difference it really would have made. I really hope she got paid for all those hours she spent as a hostage. Who knew being a legal secretary could be that exciting?